The construction of Valletta is associated with the military Order of knights of St. John also known as the Knights of Malta, leaving a legacy of numerous heritage and a fine list of buildings all over the Maltese islands. The king of Spanish Charles V gave Malta to the Sovereign military order of Malta since at the time they had no home for their order. They remained here till 1798.They settled in Birgu and started immediately by strengthening the defenses as they knew that one day or another the Turkish armada will come to attach them due to religious rivalry between them. The great siege was won by the knights. It left a big impression over the rulers of Europe for their ability with the help of the Maltese over this victory. Immediately after the siege Grand Master Jean Parisot De la Valette stated asking for financial help from these great Christian rulers of Europe where he succeeded to get a lot of financial help as they were impressed by the defeat they inflicted on Suleiman’s war machine. So with this financial help, it was the intension to build a stronghold in Malta in order to stop the Turks from attacking mainland Europe. There was only a hilly narrow peninsula where at the far end of this peninsula there was fort St. Elmo which protected both the Grand Harbour and Marsamxett Harbour. Thus the vulnerability of the ports was evident. These two harbours are considered as two of the best natural and deepest harbours in the Mediterranean. 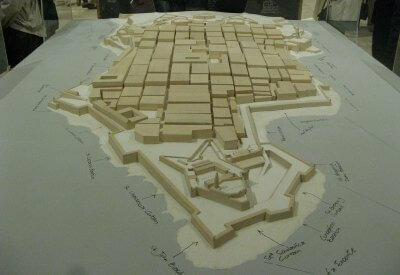 The plan was to build fortifications along the perimeter of the peninsula shaped along the natural contours of the site. These would automatically dominate and fortify the two natural harbours on each side. Thus a new city on the Sciberras peninsula was being born. No time was wasted and the Pope of the time sent the best Italian military engineer Francesco Laparelli to design the fortifications and the city's urbanization. The fortifications are a result of the best European military architecture of the time. Laparelli had an initial design idea of a main defensive lines around the peninsula, nine cavaliers and a main ditch separating the fortifications from one port to the other. The internal design was to have a grid plan for palaces and houses including a naval arsenal and an artificial harbour to be called Manderaggio. The plan was to create a uniform late Renaissance grid patterned city for palaces, houses, squares and roads. The knights themselves being part of the elite noble ruling families of Europe of the time wanted to leave an impression and elevate Malta on the European map which they succeeded. No time was wasted to start the new city where the Grand Master Jean de Valette on 28th March 1566 just 7 months after the victory of the great siege on 8th September 1665 laid the first official stone. Today on this spot there is Our Lady of Victories Church. The final decision to build the new city was taken a few days before on the 14th March. The task was so huge that manpower was not enough and 4,000 workers were brought over from Sicily to accelerate the construction. The main fortification surrounding the peninsula were completed in five years.The city was named Valletta after the grand master.Thus by 1571 the Knights could transfer all the langue convents, organisation and the highest command from the old town of Birgu to Valletta. 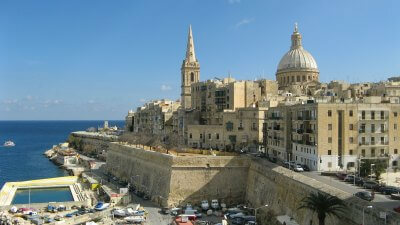 So on the 18th March 1571 Valletta became the official capital city of Malta. From here onwards they started building the Auberges, churches and other administrative buildings. From here onwards Valletta started taking shape as a city where apart from the numerous buildings of the order, many Maltese started buying land and build their homes and businesses. 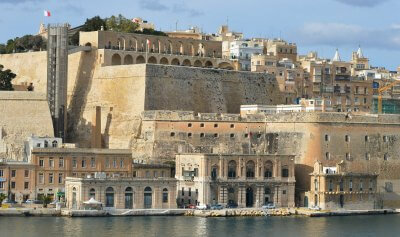 Valletta was called "a city built by gentlemen for gentlemen". It is one of the first to be selected as a World Heritage Site.